El Procedimiento de Desequilibrios Macroeconómicos: ¿Una herramienta útil para predecir crisis soberanas? This paper provides an empirical analysis of the Macroeconomic Imbalance Procedure (MIP). It explores the relationship between sovereign bond yields spreads and the variables contained in the MIP scoreboard using quantile regressions. Results suggest that MIP indicators can explain the behavior of sovereign spreads two, three and four quarters in advance. The scoreboard can’t capture strong non-variant country effects that affect the evolution of spreads as well as the different impact that each indicator has on different countries. The introduction of employment indicators has reduced the aggregate effect that country effects have on sovereign spreads. Este artículo realiza un análisis empírico del Procedimiento de Desequilibrios Macroeconómicos (PDM). Explora la relación entre los diferenciales de deuda soberana y las variables incluidas en el PDM utilizando regresiones por cuantiles. Los resultados sugieren que los indicadores del PDM pueden explicar el comportamiento de los diferenciales soberanos dos, tres y cuatro trimestres por adelantado. No pueden, sin embargo, capturar el efecto que los indicadores invariantes de país tienen respecto de la evolución de los diferenciales, así como el impacto específico que cada indicador tiene en cada país. La introducción de indicadores de empleo ha reducido el efecto agregado que las variables de país tienen en los diferenciales soberanos. This paper studies the Macroeconomic Imbalance Procedure (MIP) as an early-warning mechanism for sovereign crises in the eurozone. Results show that the MIP can be a useful tool to anticipate sovereign crisis. It has, however, important limitations that will need to be tackled to increase its power as an anticrisis tool. Results suggest that the whole MIP model can explain the behavior of sovereign spreads two, three and four quarters in advance. MIP scoreboard can’t capture time invariant country effects that affect the evolution of spreads. After the appearance of the first signs of recovery, policy makers and economists wondered what could be done to avoid the occurrence of similar-nature crises in the future. The answer to this concern was targeted from a double perspective, as De Grauwe and Ji (2016) point. On one hand, policy-makers focused on the institutional side of the problem. That is, which institutional changes should be implemented to minimize the impact of economic crises and to reduce the size of the adjustments. On the other hand, economic convergence was necessary to avoid that countries in a good equilibrium fell in to a bad one (De Grauwe and Ji, 2012). The MIP arises as a tool that complements both the institutional and the convergence efforts put in place in the period 2010-2015. According to the European Commission (2016), the Macroeconomic Imbalance Procedure (MIP) was introduced during the economic and financial crisis, with a view to strengthen EU macroeconomic surveillance in areas not covered by the Stability and Growth Pact (SGP). It aims to identify potential risks early on, prevent the emergence of harmful macroeconomic imbalances and correct the imbalances that are already in place. The MIP should, then, act as an early warning tool, minimizing the risks of economic crises. In order to achieve that goal, the European Commission releases every year the Alert Mechanism Report (European Commission, 2011-2016), where it highlights the unbalances that member estates should correct, as well as some policy recommendations to do it. The Alert Mechanism Report (AMR) is the starting point of the annual cycle of the MIP. It uses a scoreboard of selected indicators to screen each country’s need of policy action. This paper analyses the ability of those indicators to predict sovereign spreads. The research question and the approach followed in this paper is similar to the one developed in Gómez Bengoechea (2013), with some differences. First, in Gómez Bengoechea (2013) the author studies the relationship of sovereign yields with a set of macroeconomic indicators that tries to capture all the categories of determinants found in the literature. In this paper, we focus only on the MIP indicators, which allows us to compare the literature-based model with the one effectively developed by policy makers. Second, although there are some similarities in the variable selection, the MIP model includes more macroeconomic indicators than the model originally developed in Gómez Bengoechea (2013). Third, both Gómez Bengoechea (2013) and this paper, find that there is a significant country effect that affects the evolution of sovereign spreads. That country effect is smaller when we include labor market indicators, a step forward from previous research which didn’t tried to decompose or even reduce country related time invariant indicators. Fourth, in this paper we analyze the relationship between a set of macroeconomic indicators and sovereign bond spreads, not only for the period t, but also for periods from t+2 to t+4, since we want to test the reliability of the model for explaining future spreads. Finally, this paper goes beyond the model developed in Gómez Bengoechea (2013) and includes an empirical analysis of the stylized facts related to the evolution and effectiveness of the MIP before and during the economic crisis of the period 2007-2015. This article is structured as follows. In section two we examine the main stylized facts from the pre-2010 crisis years from the MIP perspective. In section three we present a model that evaluates the relationship between sovereign spreads and the MIP scoreboard. Section four offers the implications that the findings on sections two and three should have for the design of the MIP. Finally, section five concludes. There is little research on the evaluation of the MIP as an early warning mechanism. Much of it (Gros, 2012; Gros and Busse, 2013; and ESRB, 2011) is focused on specific problems, like the role of current account surpluses for the stability of the eurozone or its relevance for candidate countries macroeconomic imbalances (Bobeva, 2013). 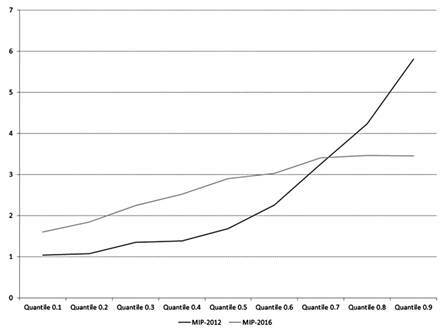 The existing research suggests that the MIP is a useful tool for warning economic unbalances in the eurozone. It can also be used as a first step towards the implementation of policy measures that may tackle potential economic problems in the region. The scoreboard is complete and it goes beyond the previous efforts that European authorities created to incentive economic stability, like the Maastricht criteria. Literature stresses, however, that the MIP has some important limitations that should be fixed in order to increase its usefulness. For the current account balance indicator, Gros and Busse (2013) point that the threshold of 6 per cent surplus is “entirely arbitrary”. This limitation applies for all the other ten indicators of the scoreboard, in fact. Another limitation found in the literature is the fact that each indicator is measured independently from the situation of the rest of the countries. This isolation does not correspond with the reality of a monetary union, where all countries share a common currency risk. In section three of this paper we highlight other limitations of the MIP related to market perception and to sovereign risk. Gros (2012) concludes that there is little that the MIP can add to the economic policy of member states. Bobeva (2013), on the other hand, accepts also the limitations of the MIP but highlights the useful information that it can provide. Table 1 shows the eleven indicators that form the original-2011 MIP scoreboard, as well as the three new labor market indicators, added in 2015. The analysis contained in this section is focused on eurozone-twelve to keep a homogeneous structure through the whole paper1. 2.2 explores the role played by internal and labor market imbalances. Figures 8 and 9 in the Appendix show the evolution of the five external imbalances indicators compared with the threshold defined in the MIP. Results suggest that some eurozone countries (Ireland, Greece, Portugal and Spain) were experiencing two important problems from external imbalance’s perspective: over-dependence on external intra-eurozone flows of capital and excessively high wages and exchange rates. The first problem can be observed in the evolution of current account balance and Net International Investment Position (NIIP). As the consensus of the literature has agreed on, this group of countries was growing thank to the excessive surpluses that countries like Germany or Austria were experiencing. 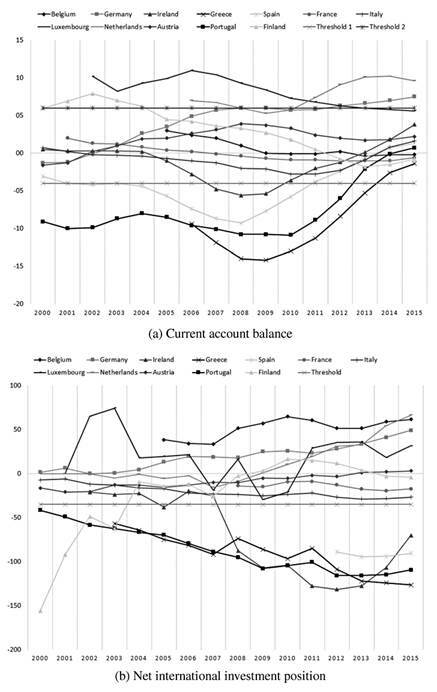 Current account balance evolution shows two kinds of imbalances in the period 2000-2007. One group of countries led by Spain, Greece, Ireland and Portugal, experienced huge current account deficits. In those same years, Finland and Austria developed current account surpluses that exceeded the threshold defined in the MIP. Net international investment position (NIIP) goal was not fulfilled by Greece, Portugal and Finland in the period 2000-2007. Current account imbalances were an increasingly worrying problem in the Eurozone in the period 2000-2007, as it can be seen in Table 2. The number of countries not fulfilling the MIP conditions rise from one to six in those seven years. As it has been previously said, surpluses and deficits in this variable highlight one of the main problems of the eurozone, as Baldwin and Giavazzi (2016) point. NIIP, which is basically the cumulative result of current account balance evolution, follows the same path but in a smoother way. In 2008 only three countries were matter of concern in that sense: Ireland, Greece and Portugal. The second problem is related with labor costs and real exchange rates. Figure 9-a, in the Appendix section, shows that mostly all eurozone countries were suffering from overvalued real effective exchange rates in the period 2002-2007. Only a small group of countries (Germany, France, Greece) experienced undervalued currencies in the first years of that period. Table 2 shows that in the pre-crisis years the whole sample, except for Austria, suffered from an overvalued real exchange rates. Real labor costs were too high for countries like Greece, Ireland, Portugal and Spain in the period 2000-2007. This seems to relate to current account balance performance, as well as to the evolution of real effective exchange rates. Table 2 shows that in 2003 seven countries were suffering from too high labor costs. On average, there are three countries that are mostly permanently suffering from high labor costs: Greece, Spain and Ireland. Export market share was not a big problem in the period 2000-2007. In the year 2002 only one country was not competitive enough to fulfil this condition. The share of exports become an increasingly worrying problem since 2008. Table 2 shows one of the biggest problems that the eurozone will need to face in years to come: its lack of competitiveness. In the pre-crisis years there were two countries suffering from an imbalance from the perspective of world exports: France and Portugal. Results for the external imbalances and competitiveness criteria show that there are four countries that are constantly experiencing them in the period 2000-2007: Greece, Ireland, Portugal and Spain. Their high labor costs and their overvalued real exchange rates are the main drivers of these problems, but they are also exacerbated by the surpluses in countries like Germany or Austria. Source: Own estimations based on Eurostat data. Internal imbalances are connected with external ones; the flow of foreign financing arriving to peripheral counties from the core of the eurozone, boosted private credit. Consequently, real estate demand increased dramatically, as well as house prices in countries like Spain or Ireland (European Commission, 2010a; 2010b; 2011; 2012). These movements led, also, to an increase of private sector debt. House price index shows a dramatic increase in real estate prices in countries like Spain, Ireland, France and Luxembourg in the period 2000-2007. The evolution of this indicator seems to be highly correlated with the result of current account balances. In the year 2005 seven countries experienced an imbalance on this indicator, as it can be seen in Table 2. In the years 2004 and 2006 the number of countries in the same situation was six. So, important increases in real estate prices were happening in at least half of the eurozone countries in the years that preceded the crisis of the period 2007-2015. Excessive credit growth was found in Ireland and in Spain during the last years of the period 2000-2007. The evolution of this indicator suggests that these two countries were the ones that experienced the largest increase in foreign investment and the largest external disequilibria. Private sector credit and house prices work as a mirror for the external imbalances described in the previous section. For this indicator, the number of countries in a situation of imbalance peaked in 2007 with six countries, as it is shown in Table 2. Figure 10-c, in the Appendix section, shows the evolution of private debt. Results show that there is a clear outlier (Luxembourg), whose results must be analyzed separately given the dynamics of its financial sector. Portugal, Ireland, Spain and Netherlands are the other economies that experienced an imbalance on this indicator in the observed period. For the case of Netherlands, private debt behaves in a very stable way. The problem is deeper in the other three countries, where there is an increase, which could translate into weaker growth due to the reduction in consumption needed to service new debt. Public debt evolution highlights the fact that public finances have been a matter of concern since the creation of the eurozone. In the period 2000-2007 seven countries experienced excessive sovereign debt imbalances. Out of those seven countries, three of them were particularly high at the beginning of the period: Belgium, Italy and Greece. Spain, Ireland and Portugal joined that group of unbalanced countries once the eurozone crisis busted. Private sector debt and public sector debt experienced a similar evolution, as it can be seen in Table 2. The number of countries experiencing an imbalance in its private debt grew continuously from 2000 to 2007. In 2000 only two countries were above the threshold established by the MIP. In 2007, it was three times larger. For the case of public debt, the number of countries not fulfilling this condition was four in 2000 and seven in 2007. So, again, an imbalance hitting more of 50 percent of the eurozone countries. Unemployment was not a matter of concern in the period 2000-2007. Only Greece and Spain, as well as Germany in 2006, experienced unemployment rates above the threshold of the MIP. According to Figure 11-c, in the Appendix section, the size of the financial system was problematic in the period 2003-2007 in four eurozone countries: Luxembourg, Ireland, Spain and Austria. The most dramatic case was Ireland. The particular financial crisis that the country experienced in that period, highly connected with its real estate exposure, seems like a key element to understand the evolution of the country in the period 2007-2015. Unemployment rate and financial sector liabilities are showing specific countries imbalances, not general ones. Table 2 illustrates this fact. The maximum number of countries not fulfilling the condition of the MIP is four in both cases. In the case of financial sector liabilities, the greatest concern seems to be focused in the years immediately before the burst of the financial crisis, in the years 2007 and 2008. The MIP scoreboard was updated in the year 2015 with the addition of three employment indicators: activity rate, long-term unemployment and youth unemployment. Data for them is available only from 2004, as it can be seen in the Appendix section and in Tables 2. They will be part of the analysis developed in Section three. The results shown in this section suggest that the MIP could have warned European policy-makers about some of the imbalances that led to the crisis of the period 2007-2015. The stylized facts shown in this section match with the consensus view on the causes of the eurozone crisis described in Baldwin and Giavazzi (2015, p.19). According to their view, “in the case of the Eurozone crisis, the imbalances were extremely unoriginal. They were the standard culprits that have been responsible for economic crises since time immemorial - namely, too much public and private debt borrowed from abroad. Too much in relation to the productive investment financed through the borrowing”. Half of the eurozone countries experienced imbalances due to excessive public and private debt rations in the pre-crisis years. Those debts are the consequence of excessive borrowing from other eurozone countries. Current account imbalances would have warned about this excessive lending / borrowing problem. Other indicators that were found as relevant from the MIP perspective are also connected with this crisis consensus narrative. That is the case of NIIP, private sector credit and real estate prices. There other elements that this narrative does not take as central causes for the eurozone crisis but that the MIP would have signaled. That is the case of over-heated (real effective exchange rates) and not competitive (labor costs and shares of world exports) countries. Will the MIP predict the next sovereign crisis? This section analyses whether the MIP scoreboard indicators can explain the future evolution of sovereign spreads and, thus, to predict the occurrence of new sovereign crises. In order to do that, we build a model that shows the relationship between ten-year sovereign bond yields spreads since the creation of the eurozone and the MIP scoreboard indicators. As it is pointed in Gómez Bengoechea (2013), default risk is usually measured through three different indicators: sovereign bond yields, sovereign bond yield spreads versus a benchmark bond and credit default swaps (CDS). In the specification that we propose we have selected 10 years sovereign bond yield spread as the variable that captures sovereign risk. There are two reasons for this choice. The first one is that sovereign bond yield spread versus German bond has become the main variable to analyze the default risk in Europe during the crisis 2007-2015. Literature (Bernoth et al., 2006; Codogno et al., 2003; Schuknecht, 2010) as well as policy-makers (European Commission, 2010a; 2010b; 2011; 2012) focus their research and policy proposals on the evolution of this variable. Furthermore, sovereign bond yield spreads and yields offer a similar behavior. Spreads will also let country effects to capture the cost of being country i instead of Germany. The second one emerges from the fact that, in March 2012, the International Swaps and Derivatives Association (ISDA) decided that the CDS on Greece were not going to be activated, since Greece did not actually default on its debt (ISDA, 2012). The database has been built using the following criteria. First, under the MIP analyses, quarterly data are usually employed even if sanctions and warnings are established on a yearly basis. When official quarterly data was available on the MIP framework or on Eurostat dataset (current account balance, NIIP, labor costs, private debt, public debt and unemployment rate) the indicator was used with no further transformation. Second, when the official indicator established a 3-year or 5-years changes for it, quarterly changes has been applied. That is the case for real exchange rates, share of world exports, house prices and financial sector liabilities. This allows the model to maintain the variation prescribed in the original scoreboard avoiding data limitations derived from the availability of certain indicators, such as the share of world exports. Finally, it is important to note that the model takes the form of an unbalanced panel, given the lack of quarterly information for certain indicators. When MIP or Eurostat data was not available, it has been retrieved from the following sources: Bank of international settlements (real exchange rate, credit to the private sector and financial sector liabilities), World Trade Organization (share of world exports), OECD (house prices) and International Labor Organization (new labor market indicators). Equation 1 captures the relationship between sovereign bond yield spreads and the set of macroeconomic indicators that form the scoreboard of the MIP. S(it+1) - Sovereign bond yield spread (10 years) of country i in period t+2, t+3 and t+4. CAit - Current account balance, as percentage of GDP. NIIPit - Net international investment position, as percentage of GDP. ERit = Real effective exchange rate, quarterly change. ESit - Export market world share, quarterly change. LCit - Labour costs, real labour productivity per person. HPit = House price index, quarterly change. PCit - Private non-financial sector credit, as percentage of GDP. PDit - Private debt, as percentage of GDP. 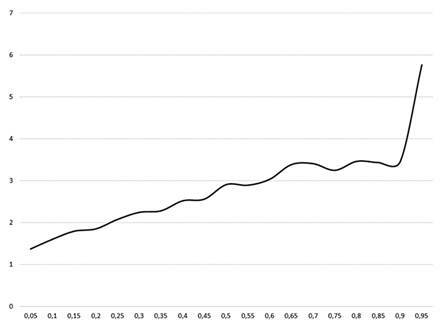 PuDit = Public debt, as percentage of GDP. URit = Unemployment rate. FSit - Financial sector liabilities, quarterly change. ARit = Activity rates, quarterly change. LtUit - Long-term unemployment rate, quarterly change. YUit - Youth unemployment rate, quarterly change. αi - Country i’s fixed effect. 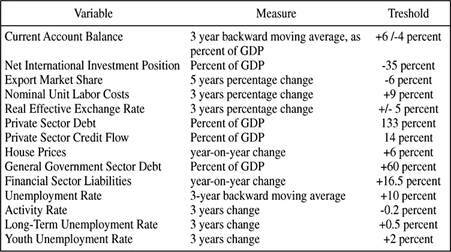 Table 3 shows the main results derived from estimating Equation 1, both including and not including the new labor market indicators. *** p<0.01, ** p<0.05, * p<0.10. As it was expected, not all the variables have a significant relationship with sovereign bond yield spreads evolution. These results suggest that some macroeconomic indicators may have more impact on investor’s perception than others. Among the significant indicators, private debt, unemployment rate, financial sector liabilities and public debt move in the same direction than spreads. This means than an increase in any of those indicators would be associated with an increase in sovereign risk. There are two indicators that show a counter-intuitive relationship with future spreads: NIIP and private credit. Regarding credit to the private sector, the MIP uses it as a measure of excessive borrowing. It could happen, however, that the lack of credit harm economic performance, as this result suggests. Investors would be, then, more concerned about the lack of credit than about the excess of it. In the case of the NIIP, results suggest that an excessively positive NIIP is correlated with higher spreads in the following quarters. There are two possible explanations for this fact. The first one is purely economic. The fact that some countries may be experiencing a positive NIIP would be seen as a warning of excessive borrowing from the rest of the Eurozone, as in fact happened in the period 2000-2007. Therefore, NIIP would be alerting about problems, not in countries experiencing a positive current account balance for several years, but about the rest of the eurozone, which would be excessively borrowing from those economies. The second explanation is methodological. 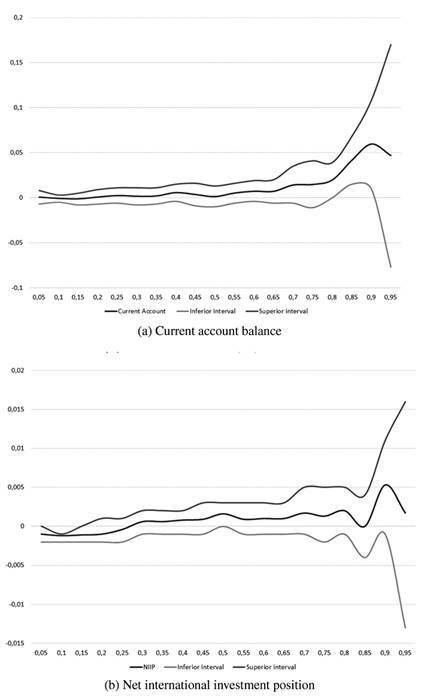 Current account balance and the NIIP may be trying to capture the same economic problem. New labor market indicators do not show a particularly strong relationship with sovereign spreads. In fact, when comparing the significance of the model both including them and not including them, there is minor change. This result suggests that, at least from the economic point of view, they could be omitted. Finally, there are huge country effects that affect the relationship between the MIP scoreboard indicators and sovereign bond yield spreads. Country effects capture time invariant country-related elements not captured by the MIP scoreboard indicators. Results in Table 3 show that they are significant in mostly all cases, except for France, Greece and Spain. This result suggests that market perception could be affected by a sentiment or reputation effect, attached to each country, affecting positively or negatively, the evolution of sovereign spreads, with a limited connection with macroeconomic indicators. The fact, as it will be shown in this section, that country effects are not constant across quantiles suggests also that market participants rely on their views, beyond economic indicators, to determine sovereign risk. In order to examine if the relationship between MIP indicators, country effects and sovereign spreads is constant for the whole distribution, we also estimate Equation 1 using Quantile Regressions (QR). As it is pointed in Gómez Bengoechea (2013), the use of OLS and QR techniques should show why OLS is not the most appropriate technique to study the relationship between macroeconomic determinants and sovereign risk in the eurozone. The existing heterogeneity among member states asks for a more precise estimation; the one provided by QR. OLS results in estimates that approximate the conditional mean of the response variable given certain values of the predictor variables. The problem with OLS estimations, as Angrist (2009) point out, is that sometimes “distributions can change in ways not revealed by an examination of averages; for example, they can spread out or become more compressed”. Following Koenker (2005), quantile regressions are a way of extending classical least squares methods of estimating conditional mean functions by offering a variety of methods for estimating conditional quantile functions, thereby enabling the researcher to better explore heterogeneous covariate effects. This is of interest in many areas of research in social sciences, where the effect of policy interventions may differ on the position in the distribution. For example, the impact of a tax increase on marginal propensities to consume may differ between low-wage and high-wage individuals, or the productivity effect of a research subsidy may vary across highly productive and less productive workers. This is also important for the research question addressed in this paper. As it has been said, in order to obtain a more precise picture of the relationship between sovereign bond yield spreads and macroeconomic fundamentals, it is necessary to know what is happening to the entire distribution, looking for winners and losers, as well as averages. QR estimate either the conditional median or other quantiles of the response variable. Figures 1-2-3-4-5 show the evolution of the coefficients of each indicator, as well as the confidence intervals. Contrary to what is found in Gómez Bengoechea (2013) and what is implied in Gros (2012) and Gros and Busse (2013), coefficients of the quantile regressions are mostly constant for the five external imbalances indicators and for four of the internal imbalances. The other more volatile internal imbalances indicators are unemployment rate and general government gross debt. These two indicators do not show a constant relationship with spreads for every quantile. This suggest that a onepoint increase in any of them is associated with a bigger increase in sovereign bond yields in those countries that are already experiencing higher spreads. Furthermore, the two of them were found to be significant for mostly all the quantiles. New labor market indicators show a constant relationship with sovereign spreads for the entire distribution. As it was said before, country time invariant effects are significant in determining sovereign bond yield spreads in mostly all cases and quantiles. QR results suggest that the fact of being country i instead of Germany has a stronger relationship with sovereign bond yield spreads as we move from quantile 0.1 to quantile 0.9. In order to confirm this “reputational” result we will develop a heterogeneity index that will show the aggregate behavior of these country indicators. Equation 2 shows the aggregate effect of country variables on sovereign bond yield spreads, for every quantile. This heterogeneity index is defined similarly to mean average deviation. The index shows the aggregate effect of country variables on sovereign bond yield spreads, for every quantile. This measure should be more effective than just using absolute values, since it penalizes more outliers thanks to the use of squared parameters. Results are summarized in Figure 6. Heterogeneity increases for all quantiles. This suggest that the fact of being country i instead of Germany has a stronger relationship with spreads for countries that are currently facing high spreads. MIP indicators, thus, can’t explain by themselves the interest that countries must pay for their public debt, especially in the most problematic cases. It is important to highlight that the results contained in the previous sections show relationships between variables without assuming causality. The implications for the MIP design contained in the following paragraphs can only, then, be tentatively stressed since more research is needed to confirm causality relations. NIIP has a positive and significant relationship with spreads. This suggests that, as in the case of current account balance, it would be necessary to add an upper threshold for the NIIP indicator. As it has been previously said, NIIP has been found significant with a positive sign in mostly all the estimations for Equation 1. The MIP uses the NIIP as an early-warning signal for over-borrowing. In a monetary union, however, it is very likely, as it was shown in Section 1, that countries over-lending may be doing so to other countries in the same monetary union. That is why an upper and downer threshold, acting together, should be considered as a warning signal for over-borrowing/lending. Further research is needed to set up that threshold. It could be also useful to establish a downer threshold for labor costs and private credit. Those two indicators are used by the MIP as early-warning signals for too high wages and excessive borrowing. The different estimations of the Equation 1 show that labor costs are significant, with a negative sign, for explaining spreads in the periods t+2 and t+3. That suggest that low wages are also related with higher spreads and that negative changes in this indicator should be also considered, given its theoretical impact on growth and consumption. Credit to private sector behaves in an analogous way. Without enough credit to the private sector default risk tends to increase, as it is shown in De Grauwe (2011). Spreads and sovereign bond yields are default-risk measures based on market perception. Not all the indicators seem to worry financial risk-takers in the same way. There are eight indicators, out of fourteen, that have been found as significant in determining spreads in any of the estimations of Equation 1. 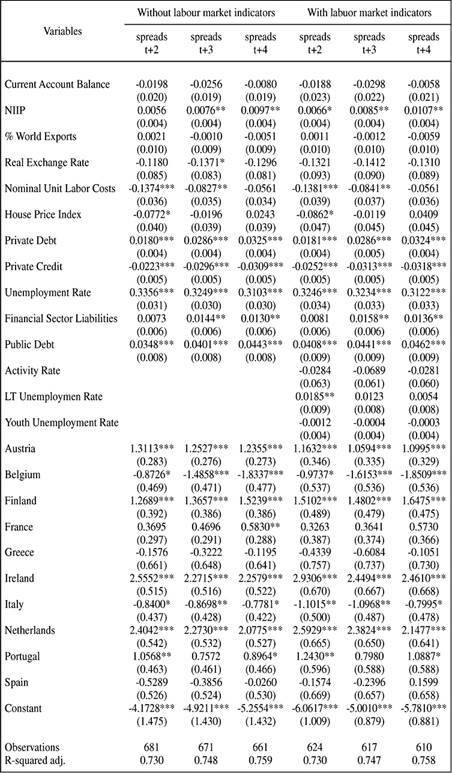 %Those indicators (NIIP, nominal unit labor costs, private debt, private credit, unemployment rate, financial sector liabilities, public debt and activity rate) should be more weighted in the different analysis computed by the European authorities. %Countries experiencing higher spreads should particularly tackle labor market and public debt problems, since the size of the coefficients found in quantile regressions are higher for them. There is also an interesting paradox lying in the obtained results. The consensus of the literature (Baldwin and Giavazzi, 2015) establishes that the real source of the eurozone crisis is a sudden-stop in credit to peripheral eurozone countries from core ones. Results show, however, little worries for external indicators. Only two of them are found to be significant at some point. %Besides, market participants seem to look at those two indicators (MIIP and nominal labor costs) in a different way to the view established in the MIP scoreboard. Regarding new employment indicators, they do not play a crucial role in determining sovereign bond yield spreads. It is obvious that labor market performance is a critical concern for policy-makers in the eurozone, especially in countries like Spain, Greece or Italy. Its impact on the perception of sovereign debt investors is far from clear. Strong unemployment rate results suggest that market perception on labor market performance could be based only on this indicator, which raises the question on whether the three new-employment indicators are useful for predicting sovereign crises. Country effects capture all the country-idiosyncratic elements not included in the other variables of the model. It would be necessary to conduct further research to find out what is hiding behind those country effects. They can be interpreted either as a measure of a country reputation or market perception. In that case all countries seem to be perceived worse than Germany, given the positive signs found for mostly all of them. The exceptions would be Belgium, Italy and Greece, which seem to be biased by their high pre-crisis public debt stocks, in all three cases above 100 percent of GDP. Research by Eichengreen and Wyplosz (2016) and De Grauwe and Ji (2016) suggest that the lack of an adequate institutional framework in the eurozone was partly behind the exacerbation of sovereign spreads in the period 2010-2012. According to their view, the Outright Monetary Transactions (OMT) program, approved in the third quarter of the year 2012 let the ECB to act as a backstop for public debt payments. Before that moment, the ECB was not able to guarantee the repayment of all public debt as in a stand-alone country. As it can be seen in Figure 12, the heterogeneity index is higher and more volatile when we compute Equation 2 only for the period 2000-2012, till the approval of the OMT program. This result suggest that country effects could be capturing a common eurozone problem derived from the lack of adequate policies or institutions to tackle diabolic-loop derived imbalances. In the year 2015, eleven out of twelve countries in the eurozone were experiencing an imbalance due to excessive public debt. Excessive public debt, which was not a problem before the beginning of the crisis, is nowadays one of the biggest threats for the stability of the Eurozone, according to the MIP. This paper studies the Macroeconomic Imbalance Procedure (MIP) as an early-warning mechanism for sovereign crises in the Eurozone. Results show that the MIP is a useful tool in preventing sovereign crises, although it has important limitations that will need to be tackled to increase its usefulness as an anti-crisis tool. Results suggest that the MIP model, contained in Section two, can explain the behavior of sovereign spreads two, three and four quarters in advance. The model can’t capture strong non-variant country effects that affect the evolution of spreads as well as the different impact that each indicator has on every country, depending on its current disequilibria. The stylized facts described in section two show that some eurozone countries (Ireland, Greece, Portugal and Spain) were experiencing two important problems from the perspective of the external imbalances in the pre-crisis years. The first one is a deeply negative current account balance. The second one has to do with labor costs and real exchange rates. It is not only that Ireland, Greece, and Portugal were dependent on foreign money to finance their economic growth, it is also true that these economies were not particularly competitive in that period. Internal imbalances relate to external ones. The flow of foreign financing arriving to peripheral counties from the core of the eurozone, boosted private credit. Consequently, real estate demand increased dramatically, as well as house prices in countries like Spain or Ireland (European Commission, 2010a; 2010b; 2011; 2012). These movements led to an increase of private sector debt. From this perspective, public and private debt were highlighted by the MIP as excessive for half of the eurozone countries in the pre-crisis years. The analysis of the external and internal imbalances generated in the pre-crisis years is not enough, however, to evaluate the power of the MIP scoreboard as an early-warning mechanism for sovereign crises. The model developed in section three shows that not all the variables in the MIP have a significant relationship with sovereign bond yield spreads evolution. Among the significant indicators, private debt, unemployment rate, financial sector liabilities and public debt move in the same direction than spreads. The MIP uses private credit as a measure of excessive borrowing in the private sector. It could happen, however, that the lack of credit harms economic performance, as this result suggests. Investors would be, then, more concerned about the lack of credit than about the excess of it. Contrary to what is found in Gómez Bengoechea (2013) and what is implied in Gros (2012) and Gros and Busse (2013) the constant threshold for every eurozone country, and for all indicators, seems to make sense as part of the MIP scoreboard system. The coefficients of the quantile regressions are mostly constant for the five external imbalances indicators and for four of the internal imbalances indicators. The other two internal imbalances indicators are unemployment rate and general government gross debt. These two indicators do not show a constant relationship with spreads for every quantile. Country non-variant effects are significant in determining sovereign bond yield spreads in mostly all cases and quantiles. QR results suggest that the fact of being country i instead of Germany has a stronger relationship with sovereign bond yield spreads as we move from quantile 0.1 to quantile 0.9. Heterogeneity index suggests that the fact of being country i instead of Germany has a stronger relationship with spreads for countries that are currently facing high spreads. The MIP indicators can’t explain by themselves the interest that countries have to pay for their public debt, especially in the most problematic cases. Research by Eichengreen and Wyplosz (2016) and De Grauwe and Ji (2016) shows that the lack of an adequate institutional framework was partly behind the exacerbation of sovereign spreads in the period 2010-2012. According to their view, the Outright Monetary Transactions (OMT) program, approved in the third quarter of the year 2012 let the ECB to act as a backstop for public debt payments. Before that moment, the ECB was not able to guarantee the repayment of all public debt as in a stand-alone country. As it was shown, the heterogeneity index is higher and more volatile when it considers on the period 2000-2012, until the approval of the OMT program. This result suggests that part of the country effect can be interpreted as a common eurozone problem, derived from the lack of adequate institutions to tackle economic imbalances. The authors of this paper would like to thank the anonymous referees of this journal for their useful comments, insights and suggestions on our research. This paper is better thanks to them. 1 No more countries could be included due to data availability problems that will be described in section three of this paper. In this section, Luxembourg will be included in all the analysis. Sections three and four don’t include Luxembourg in the sample, since there is not enough quarterly data for the MIP indicators.